This is Bad Hair Day on HDTracks. And The Alternative Polka is 5 minutes... does that mean... BUDDY HOLLY POLKA???! 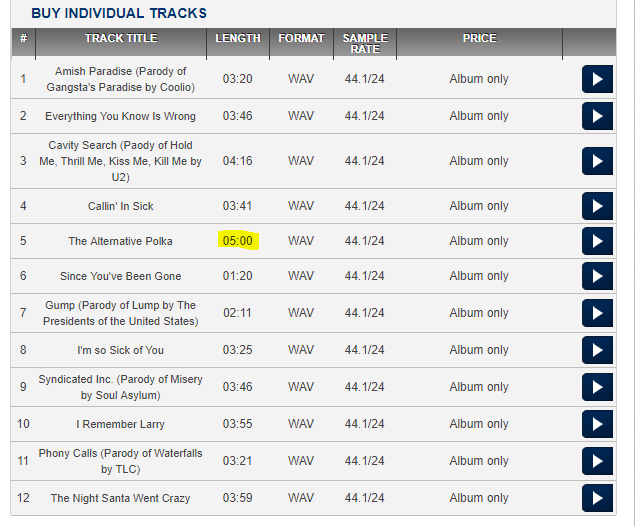 Looking through Google results, I am finding lots of sources that list the track as 4:51, but they are taking that info directly from HDTracks. So, it looks like the time code has been either changed or updated on the site, so I'm not quite sure. It seems odd they would randomly add the Buddy Holly segment in months after its initial release.